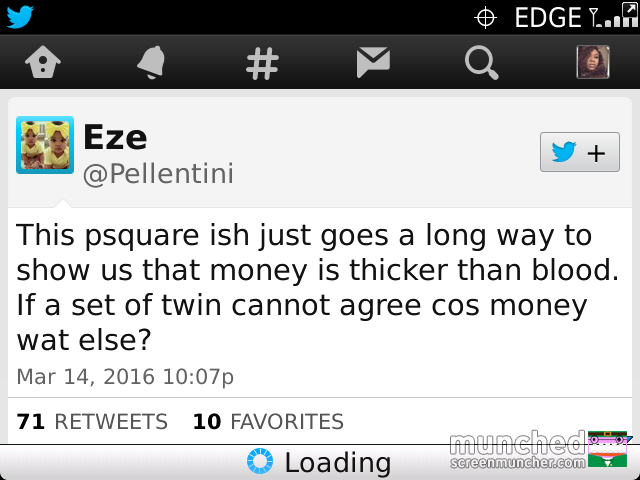 Psquare Ruckus And Going Solo!!! ~ CK Jacob: Nigerian Fiction And Lifestyle Blog. 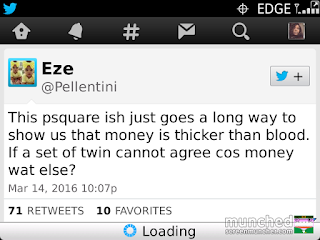 Yesterday Psquare (Peter and Paul were trending on twitter because of the news all over some blogs that they are splitting and both of them has released a song individually. I am a huge fan of Psqaure and will continue to be. The truth of the matter is they are keeping us (fans) in silence. Peter performing alone in a club does not mean they will not be able to perform together on stage together. Some irrational fans are pointing accusing fingers at their wives especially Lola, probably because some of them were uncomfortable with the union. Their spouses may not have a hand in this brouhaha. I cannot conclude because I do not know the full story. Some fans said Peter married a grandma because his partner is other than him with few years and his elder brother Jude Okoye was not in support of the union. I heard one gist that Munachi Abii was the woman Jude wanted his brother to marry. The news of Jude not attending Lola and Peter’s wedding went viral and his younger brother (Peter) paid him back by not gracing his own marriage ceremony too. Do I blame him? No. Do me I do you, God no go vex! People have forgotten that Jude and Peter have different personalities with different ambitions. What if one of them is no longer interested in singing again do we blame that person? I don’t think so. 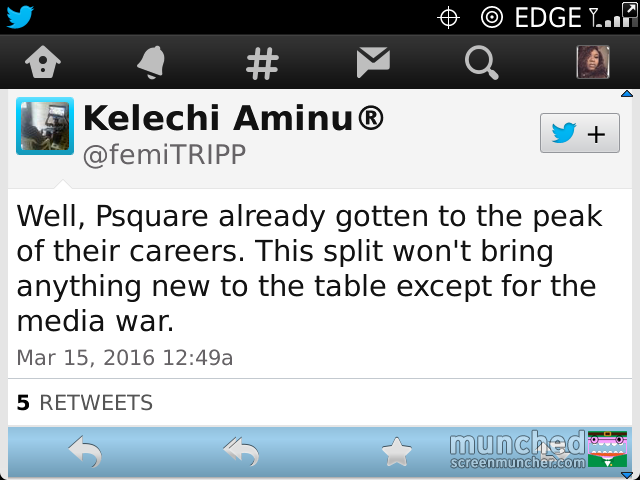 I think Peter has the right to fire his brother as his manager if both of them are not compatible working together. Their ways of reasoning might be different from each other. We humans are different whether you are a twin or not. 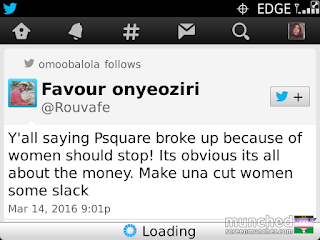 I applaud Pquare for keeping it real, entertaining us with beautiful and blazing songs. I cannot forget songs like Omode mi, Senorita, Say your love, Bizzy body, Ifunaya, Temptations, Testimony, Alingo, and so many others. My favorite is 'Forever'. I love the song! Some of their fans tweeted about the alleged break up. Here are some of the tweets. I don’t think we should point accusing fingers on any of them, I just feel this is the time for them to go solo and make use of their talent independently. Peter with many endorsement deals and investments is a fantastic dancer and a good singer. Paul is a better singer and an okay dancer. Paul posted a message on his Instagram page, saying he wished his mother was still alive. He is probably using that to get sympathy from his fans. Paul is considered the quiet one, and Peter the lousy one because of his candidness. I believe they can succeed separately. Jackson 5, Destiny’s child…. went their separate ways and it was not the end of the world. Legends, great singers came out from these groups. 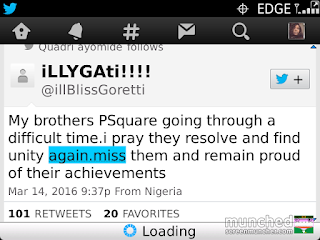 If they can, Psquare can! I don’t not see any big deal it in it as long as it won’t turn them into enemies. I wish the both of them what they wish their selves. May they shine and prosper as they go solo. I still believe they will sing together, it may not be now but later. Let’s keep our fingers crossed and watch how it end. Are you a fan? 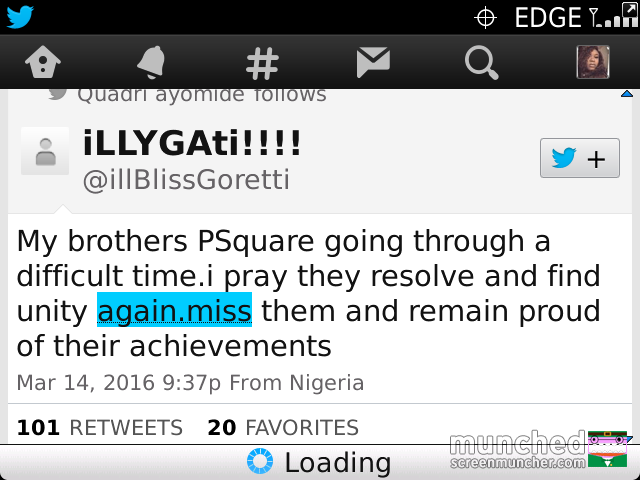 What do you think about Psquare brouhaha? And the drama continues. Blaming any of the wives is quite unfair. I want to believe they are mature enough to make whatsoever decisions they wish to. Make I sidon dey look! 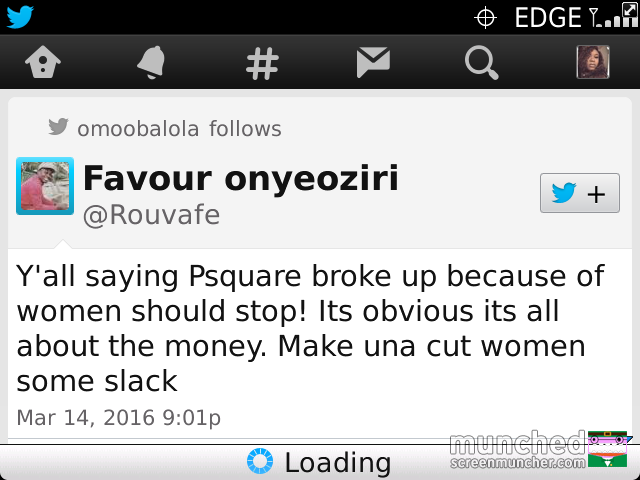 People with small brain think their wives caused it. Its a shame they can sort what they are passing through privately. I hope they don't turn enemies. According to ck, I wish them what they wish themselves.